An SEO client of ours recently asked me to look into their Adwords agency’s performance, as they had spent close to $30K in two months. Understandably, this particular client felt that he was spending too much. To view this particular client’s Adwords campaign, I needed to access Google Analytics. 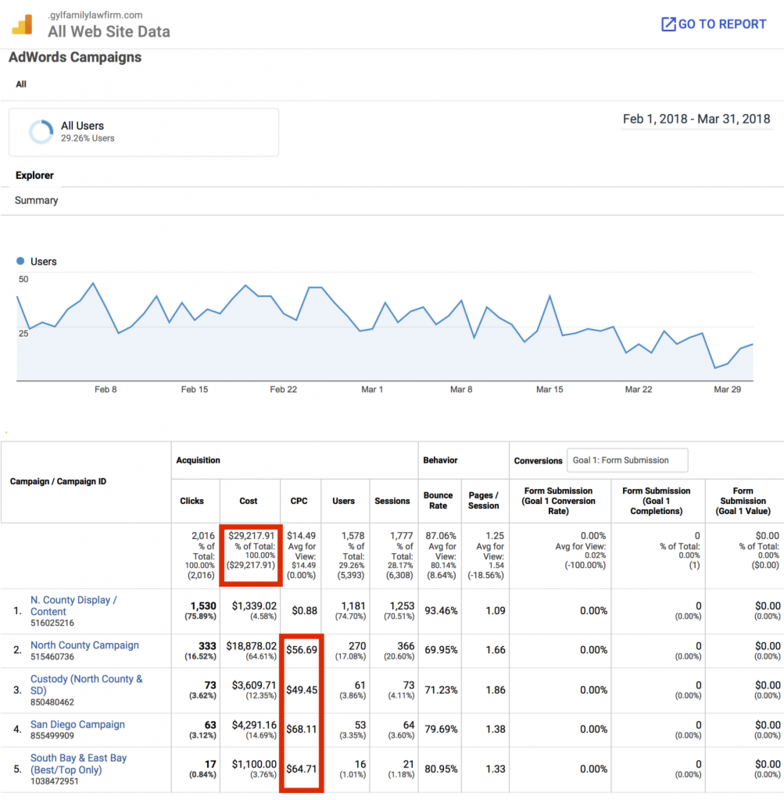 Since I didn’t have access to the agency’s Adwords campaigns, but GA was set up already, I had access to most of the data I needed to see what was happening. I first set the parameters so that I could analyze the numbers between February and March of 2018. It was then that I realized the client had paid over $50 per click for most ads! This particular client is a lawyer, so it is understandable that the ads are so expensive to run. However, even for a lawyer, and in my many years of experience, these PPC fees seemed excessive for any professional to pay. To make matters worse, with an average 2% conversion rate, this client was paying close to $3K per lead! Even if every single lead became a paying client – which is never the case – this was an awfully large sum to secure a single client. I also looked at other key performance indicators (KPIs), such as the website’s bounce rate for paid ads as well as organic Google visitors. The bounce rate of a site indicates the percentage of visitors that land on your website and leave soon after without clicking on any other pages. 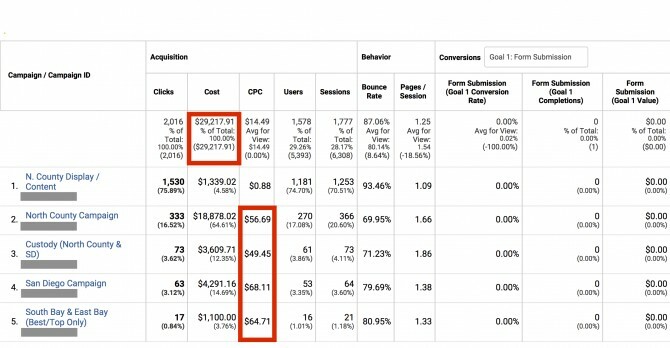 The bounce rate from Adwords ads averaged 87.06% compared to just 45% for organic visitors – almost twice as much. This was another indication that the ads were not very effective. Another issue was that the agency was targeting areas beyond the target market of San Diego & Carlsbad, California. 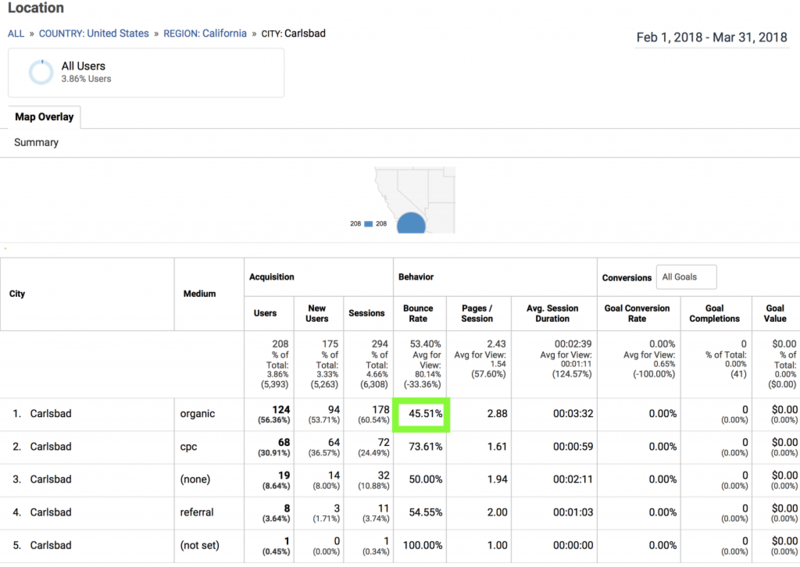 The visitors who came to the site from Los Angeles, for example, only spent 37 seconds on the site. 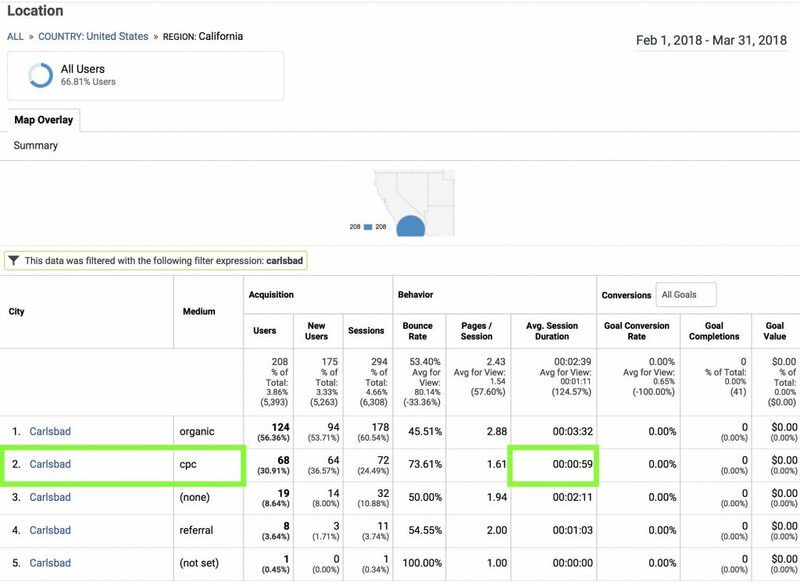 On the other hand, from the same Adwords campaign, those who came to the site from Carlsbad (where the client is actually located) spent 59 seconds on average (almost twice as long). 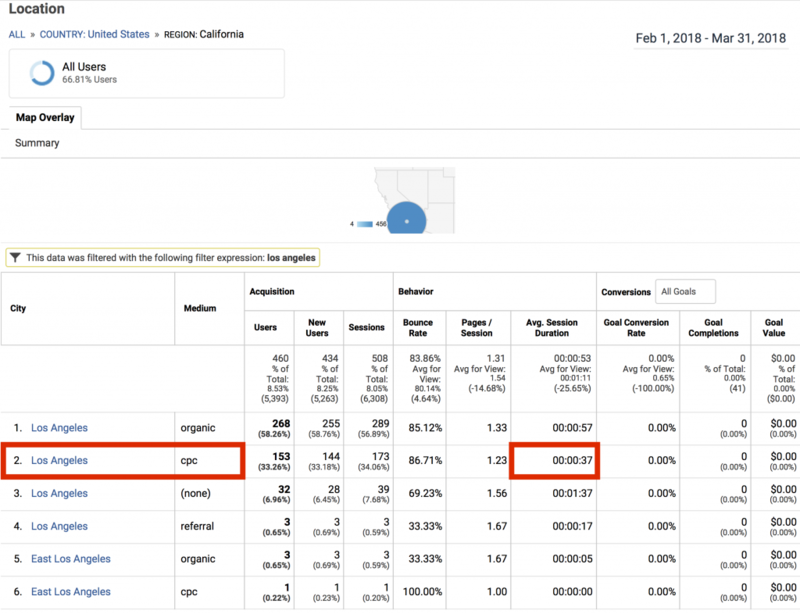 These results clearly showed that the prospects who were from the LA area were not very interested in the site’s content, and thus would leave the site completely. The answer’s obvious. These prospects are unlikely to drive 87 miles (the distance from LA to Carlsbad) to visit our client’s office and become a regular client. 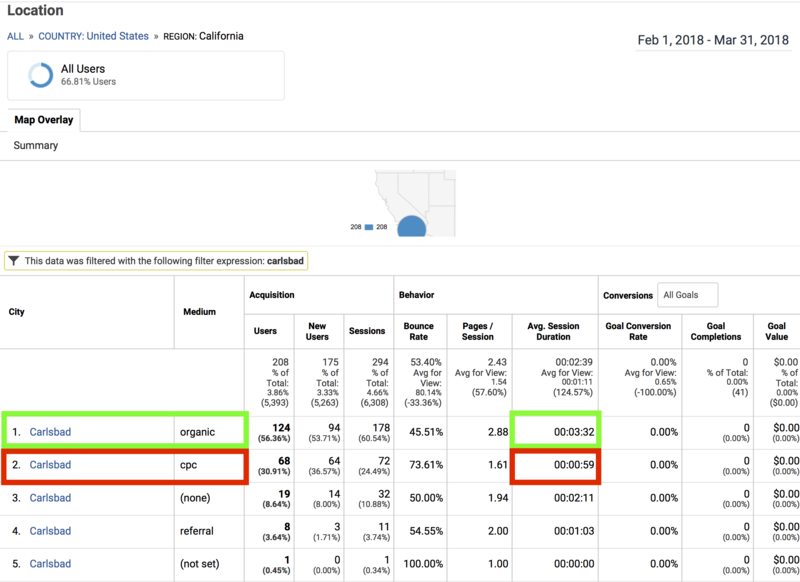 Just a side note that those site visitors located in Carlsbad who came from Google organic, on average, stayed on the site for three minutes and 32 seconds (more than three times compared to those coming from Google Adwords). This is because most of us trust Google organic results more than ads when we search on Google. I quickly concluded that the client was paying a premium to get a single client. 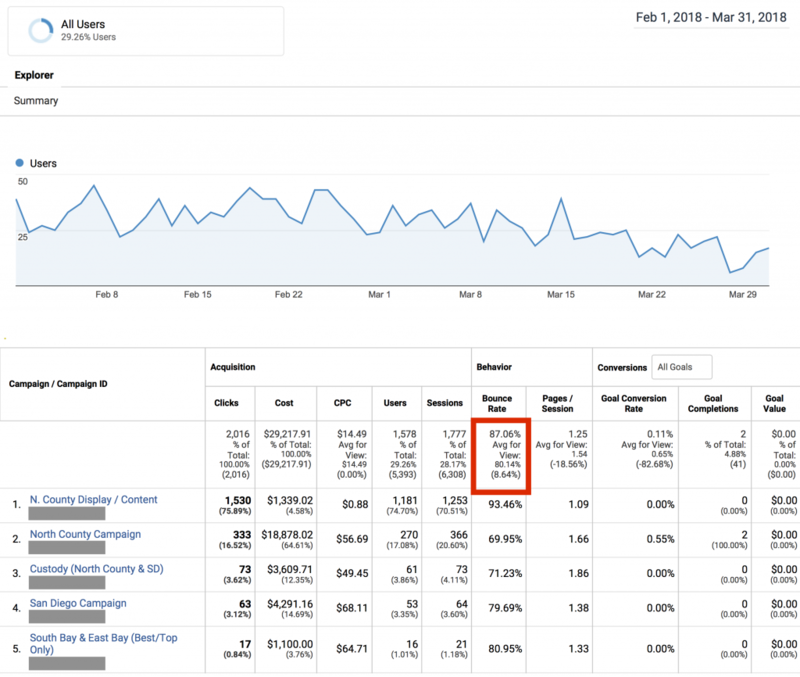 The lesson is to ensure your ads are targeted properly and keep an eye on your bounce rates. If your bounce rates are suffering, find out why. Furthermore, if you’ve ever hired an agency to run your Adwords campaign, it is always best to pay them a flat fee and not a percentage of your budget for your ads. This way, they won’t be motivated to boost your spending on Google, and you’ll be sure to get the absolute best lead acquisition rates. Another suggestion I have is to always run a conversion monitoring campaign – especially if you’re running multiple advertising campaigns, such as SEO, Adwords, and Facebook ads. Monitoring your conversions allows you to see where your leads are coming from and determine your cost per acquisition. You can then make very informed decisions based on actual data on where to focus your marketing dollars. If you are running an Adwords campaign, we’d be very happy to see how it’s performing. More often than not, we can save you thousands of dollars. Call us at the number above or fill out our form and one of our representatives will assist you.